I've had 4 children and picked up a lot of scars over the years too. 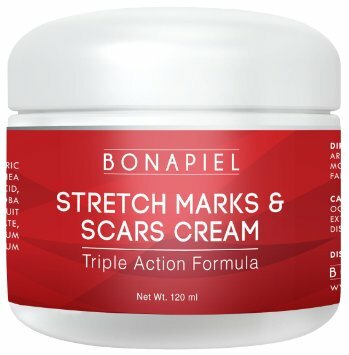 I've tried many different stretch mark and scar creams but never had one show results this fast. Bonapiel's Stretch Mark & Scar Cream is a rich, creamy formulation of Rose Hip Seed Oil, Jojoba Oil, Mango Butter, Organic Olive Oil, and Aloe. It goes on so silky smooth and leaves your skin soft and hydrated. It's not just for scars and stretch marks, it can be used for cracked dry heels or dry skin anywhere else. Just in a short time the edges of my stretch marks are already lightening and less noticeable. With longer use I can't wait to see how much they improve. This isn't just for women either, men get stretch marks and scars too.Plus this cream not only helps to make your stretch marks and scars less noticeable, it also prevents new ones from forming. How awesome is that? There's a 60 day 100% satisfaction guarantee too.